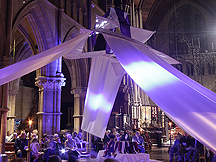 Cloth For The Cradle was a giant tabernacle that was designed and built to accompany the service Carols By Candlelight 2013 at St Peter’s Parkstone, based on the Iona Community Cloth For The Cradle Service. The central part, made of concentric squares covered a large wooden crib. Each of the four arms of the tabernacle was connected to the middle during the service one at a time. At the culmination of the service, the entire structure was lifted up to a point high above the congregation in the middle of the nave. This revealed the crib and the congregation were then invited to enter the tabernacle and place a strip of cloth into the crib as a prayer. Projected into the centre of the tabernacle were angels animated and produced by Martin Coyne (www.martincoyne.com). The aim was to invite the community to actively experience walking into the tabernacle and place their cloth into the manger, which many also said reminded them of the stable in Bethlehem. Thanks to Derek Moore and Dave Taylor for photography.